1.Print off the M template and draw onto the back of your chosen Paper Flowers 12x12 sheet. Remember to turn the template over, so that it’s the right way around when you cut it out. 2.Cut a piece of backing paper from the Paper Flowers pad, 20cm x 25cm, to fit inside of the frame. 3.Adhere the M to the centre of the backing paper using foam pads to add dimension. 4.Die cut some of the flowers and leaves from the Paper Flowers paper pad, adhere to the top right of the M.
5.Add enamel dots to the centre of the flowers and 3 to the left bottom side of the M to balance it out. 6.Cut strips of co-ordinating paper to decorate your frame to finish. 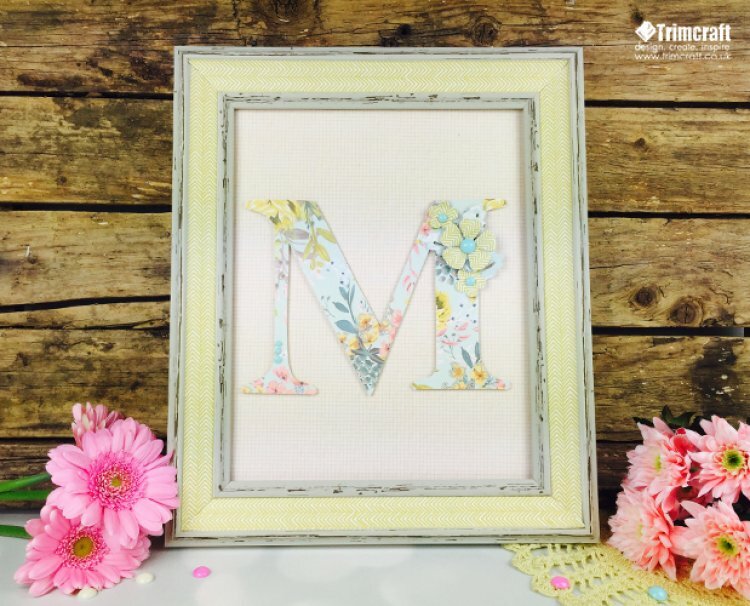 This make would certainly make mum proud, you can use a range of pretty embellishments based on what your mother loves, and with our endless collections, you won’t be stuck for choice! Remember to upload your versions to the project gallery so we can see how you’ve personalised your lovely frames!